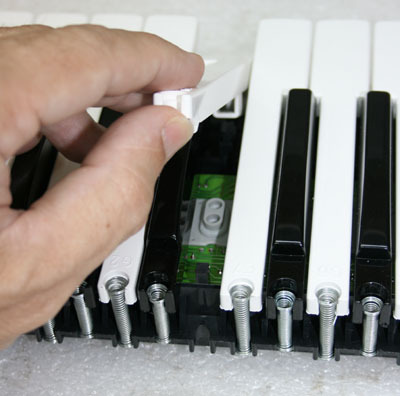 Once you have access to the keybed, remove the key return spring by inserting a small Phillips screwdriver into the spring. Simply push down to draw the spring out of the lower seat. 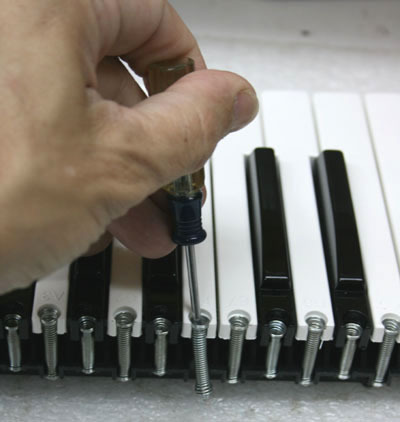 Note that some keyboards use different springs for the white and black keys. Once the key spring is removed, the back of the key should lift up easily. Slide it a bit toward the front, and the key will come free. Because the key needs to slide forward to be released, you won't be able to get any black keys free without first removing the white keys that block them in. Simply reverse this procedure to install the replacement key. Replace the key return spring, and you're good to go!